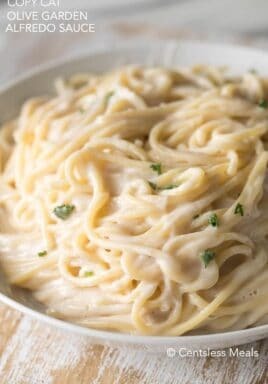 If you like creamy white pasta sauce, you will absolutely love this Olive Garden alfredo sauce recipe! It’s rich, creamy, and cheesy, and it has just the right amount of pizzazz — compliments of the bit of garlic powder stirred in at the end. This recipe makes enough for four servings, but you can easily double it if you plan on serving a group. 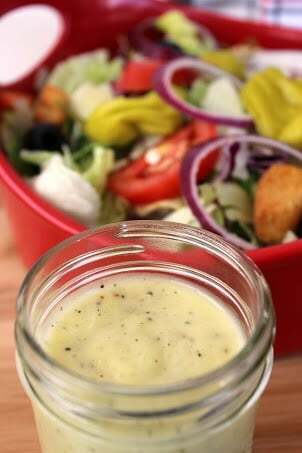 The Olive Garden alfredo sauce recipe is definitely one of the easiest sauces you’ll ever make from scratch! 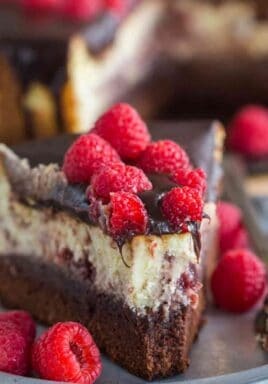 While you can substitute low-fat cream cheese if you must, using all of the ingredients as listed will give you the most authentic results. And keeping best results in mind, Parmesan cheese is a key flavor ingredient in this sauce, so you should either buy it freshly grated in your grocer’s refrigerated section, or even better, buy a block of fresh Parmesan cheese and quickly grate eight ounces (1 cup) for this recipe. Boil your pasta and let it drain while you are making your sauce. Use a heavy-bottomed sauce pan. This will help ensure a nice, even heating process that is one key to making a smooth sauce. Another key to making a smooth sauce is to use a whisk, which works like a very low-tech blender and perfectly combines your sauce ingredients. Once done, this sauce will thicken slightly in the pan while it sits. You can combine it immediately with your prepared pasta. Your pasta will look even more special if you garnish it with color! Try parsley sprigs, or mix in sundried tomatoes or black olives. 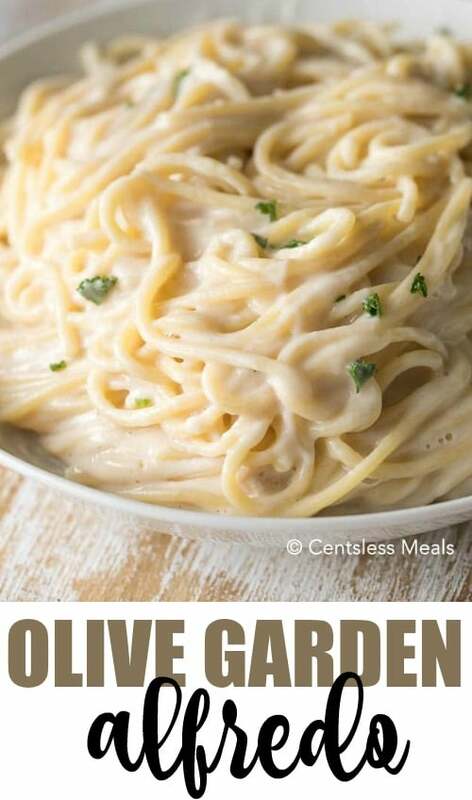 If you like creamy white pasta sauce, you will absolutely love this Olive Garden alfredo sauce recipe! It’s rich, creamy, and cheesy, and it has just the right amount of pizzazz — compliments of the bit of garlic powder stirred in at the end. 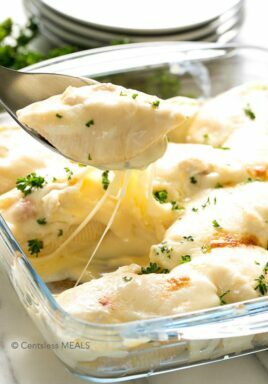 Melt butter and cream cheese in a sauce pan over medium heat until completely smooth. Add whipping cream and turn the heat to medium-high. Whisk together until smooth and slightly bubbly. Add parmesan cheese to taste. I use the full 8 oz but you can use less. Stir in garlic powder. Sauce will thicken slight upon standing. 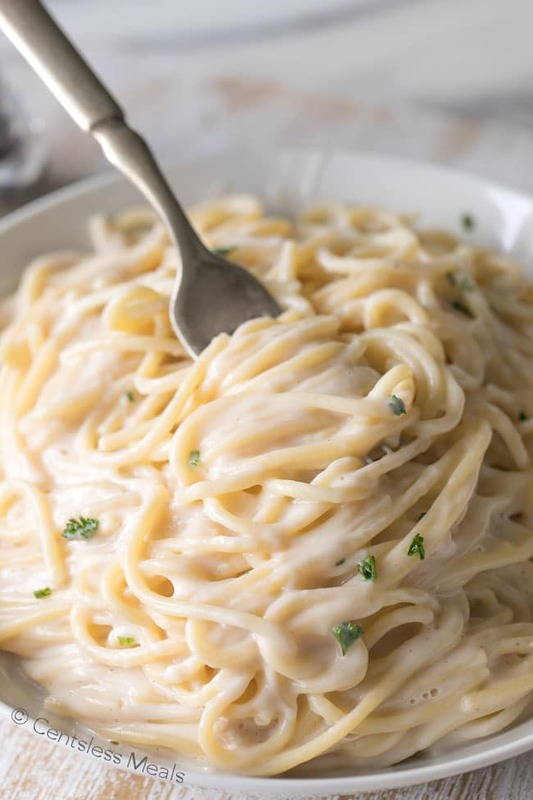 Once you try this Olive Garden alfredo sauce recipe, you won’t need or want to try any other alfredo sauce! It’s so creamy, cheesy, rich and easy to make that it will become a regular pasta sauce in your household! 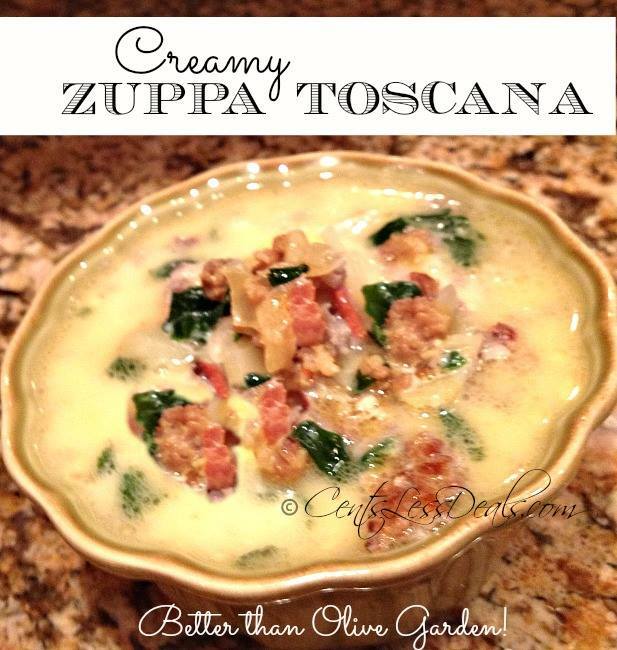 tried many Olive Garden knock off recipes, never happy with them. This one is the best I have ever found. I used a store brand of shredded parmesan so it needed a pinch of salt to bring out flavor. Will never use any other recipe. I don’t care if this is an AUTHENTIC ITALIAN ALFREDO recipe, I just wanted one that tasted exactly like Olive Garden’s does. THIS is it. THANKS so much! I’m so happy to hear that Tabby! This recipe works great! It tastes like olive Garden pasta! Its delicious! So glad to hear you loved this recipe Viviana! Authentic fettuccine Alfredo does not have any garlic! What is the best way to reheat alfredo sauce without it separating? I needed to use up heavy cream and came upon this recipe. I wanted to have enough to cover 2lb of thin spaghetti (16 servings). I adjusted the recipe ingredients amount using a total of 8oz cream cheese, 1 1/3 sticks of butter, 5 cups of a blend of heavy cream and 2% milk (specifically 3 cups of cream and 2 cups of milk), 10 oz. grated parmesan cheese, and about 1.5T of garlic powder. It made enough delicious sauce to make 16 saucy servings of pasta. I also added 1.5 lb of GFS pre-cooked, diced chicken (great timesaver), so I have chicken alfredo. 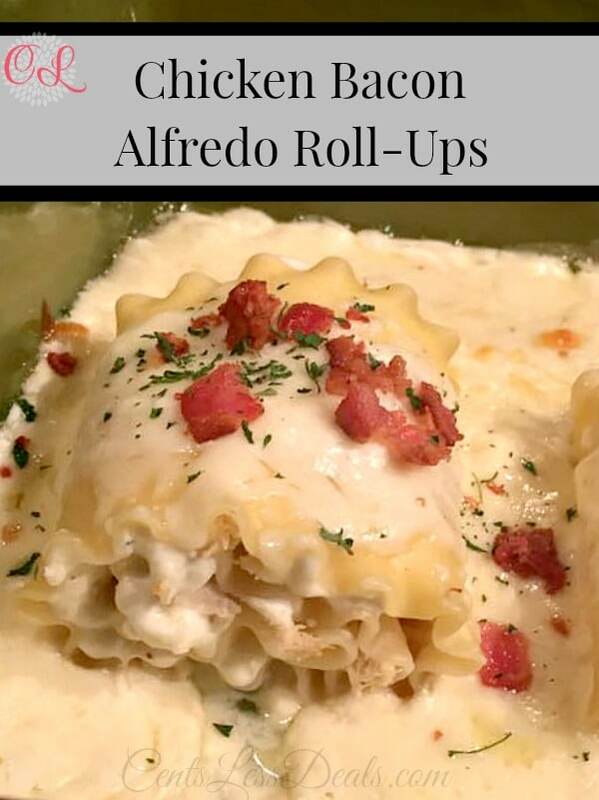 Love there afredo sauce going to try this ready soon thanks for your recipes I am trying the dressing the same night so I will have a Olive Garden dinner a home thanks. Did this with meatballs and it was amazing !! Will do it with Prawns next Thank you!! I have made this more than once! 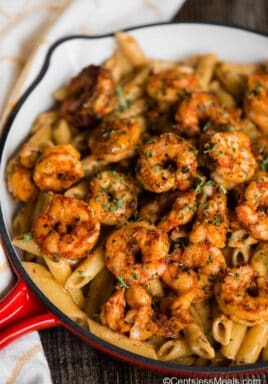 It is my favorite Alfredo recipe!!! My daughter shared this with me and I’m so glad she did. I always feel better about making something “from scratch” so I avoid preservatives and salt. I am pleasantly surprised by how well it reheats, almost better the next day! Thanks for posting. Do you use grated parmesan or do you grate your own? I love alfredo sauce!!!!! This is the best Alfredo Sauce very rich and full of flavor. Thanks for sharing with Full Plate Thursday and hope you are having a great weekend! I love this post!!!! What a great recipe. 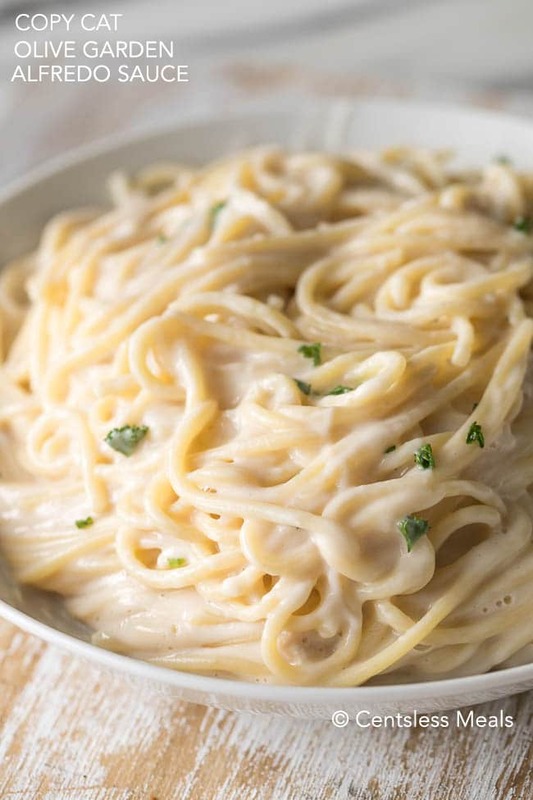 Alfredo sauce is so versatile!!! Thanks for joining ON THE MENU MONDAY and sharing this yummy sauce!